Teams must be prepared for Alliance Selection. Immediately following the Awards Ceremony, Alliance Selection will take place on each Sub-Division Field. Alliances will compromise of 4 teams. More information can be found in the Game and Season Manual. Each team will need to send two (2) representatives to the floor in front of their assigned field by 7:15am. One (1) of these two representatives will be responsible for Alliance Selection. We have reserved 40 seats per team for each of the 3 Chairman’s Award Finalists teams at Ford Field. The reserved seats are in Sections 16 and 17 lower level. Teams will need to obtain the wristbands from the field Volunteer Coordinator. All officially badged participants will enter Ford Field without going through metal detectors. All participants should limit the bags that are brought to Ford Field as bags slow the entry process. There will be two (2) complete Practice Competition Fields, as well as several carpeted areas of Practice Fields available to teams. Safety glasses are required at all times on all Practice Field spaces. Remember that teams must pass inspection prior in order to go to any of the Practice Fields. Please note the complete Practice Competition Fields will be modified slightly: There will be no Sandstorm. There will be no field sounds. Please see the insert in your Team Registration Packet for more information about the Practice Fields. Teams may only practice with their robots in their pits or in designated practice areas. Teams may not set up their own practice elements outside their pits. Remember that teams are required follow all Event Rules. Teams should also read the Expectations for events found here. Qualification matches begin at 8:30am on Thursday, April 25. Teams should start the inspection process as soon as possible on Wednesday, April 24. Weigh and measure your robot early to help the inspection process move faster. The Inspectors often spot problems and provide suggestions for correction. Robots must pass inspection prior to competing in Qualification Matches. Chairman’s Interviews will be from 11am to 4pm on Thursday, April 25 and 9am – 11am on the Friday, April 26. Chairman’s Award Interview sign-ups will be on Wednesday, April 24 from 4pm to 7:30pm in the Hall of Fame booth. Interview times and locations are filled on a first come, first served basis. There will be three Chairman’s Award Interview rooms. To avoid schedule conflicts, Chairman’s Award Interviewees are not recommended to be drive team members. Swapping interview times is not encouraged, but if you must change your time, switch with a team (once you have their consent) that is assigned to the same interview room as you and notify the Judges through the "Judge Assistant/Chairman's Room Runner", who will work with the teams and keep Judges apprised of changes. Please see this document for helpful tips as your team prepares for Championship. The Cobo Center loading dock only has one access point that is used for both entering and exiting. Teams should be prepared to stage/queue vehicles on W Fort Street. Please be patient as we have 400 team vehicles to unload. Teams should be prepared for long wait times. Teams cannot unload on W Fort Street, 2nd Street, W Congress Street, or the loading dock ramp. Teams also cannot leave vehicles unattended at any time. For detailed information, please see this document. We will open the loading dock doors at 10:00am for team load in. We are increasing to allow 6 team members to assist with load in. 2 team members must be adults of which 1 adult must stay with the vehicle at all times on the loading dock. 4 team members may be a combination of students and or adults. Please help us so that we can get teams unloaded and into the pits as quickly but as safely as possible. Teams need to pack efficiently to assist with load in and load out. Also please note that this loading dock is extremely challenging for teams that bring a bus with a trailer attached. The driver will need to know how to back up a trailer in a tight area. Please be respectful of other teams and the public in your departure, leave your area clean, and be safe. Please see this document for Load Out information. After your crate has been emptied, notify Shepard Exposition Services (SES) that your crate is ready for storage. Any weight above 400 lbs. will be assessed at a specific price per 100 lbs. by SES. Before opening your crate, check the weight on the Bill of Lading on the side of your crate. If you feel that the weight is incorrect, please go to the SES desk as they will weigh the crate in front of you for clarity. Teams may request to carry out their robot and robot crate from the FIRST Championship venue, rather than have their robot and crate shipped home. The Robot Removal Request Form is here. Requests may also be made at the FIRST Championship with the FIRST Ship Desk. Approved teams must send an adult mentor to the FIRST Ship Desk Thursday or Friday of Championship to collect their Load Out Ticket. The Load Out Ticket will be checked and collected by the volunteers at the Dock Bay Doors on Saturday to confirm the removal of the robot is approved. Teams that Carry-Out their robot must also carry-out their crate or request their crate destroyed by Shepard Expo Services for a fee of $150. Crates will not be shipped without the team’s competition robot. Robot removal requests are due by Friday, April 19, 2019. Step 1: An adult mentor from each Team must visit the FIRST Shipping Desk located in the Pits either Thursday or Friday between 9:00AM to 5:00PM each day. The mentor will confirm and sign the FedEx Bill of Lading (BOL) and receive a copy of the BOL for tracking the crate during transit. The mentor will also receive a Load Out Ticket and Zone Sticker. Step 2: After completing the FedEx Shipping documents, the mentor must visit the Shepard Exposition Services Desk to pick up a Shepard Payment Authorization form and a Shepard Bill of Lading. Fully completing both forms are required by SES. All teams except the eight teams competing during the Finale and Closing Ceremonies must have all shipping preparations done by Close of Pits at 3:00PM. Step 3: An Adult mentor must notify the SES Desk when the team is ready to accept the Robot Crate at their pit. Once the Crate arrives, pack the Crate securely and remove Shipping Labels and Documents that were used for the Transit to Championship. Step 4: Once the crate is packed and sealed, the mentor must return to the SES Desk to turn in the completed Shepard Payment Authorization form and all copies of the Shepard Bill of Lading. Step 5: Attach the Zone Sticker to the completed robot crate, facing the walkway. This signals to FIRST and Shepard that your crate is ready for collection. Teams in the United States can expect to receive their robot crate within 2-4 weeks. International teams should expect transit of 4-8 weeks due to potential customs and export delays. Tracking numbers do not automatically become active after Championship; it may take up to a week or more before a crate’s tracking number is activated as FedEx Freight will only be able to accept a limited number of team crates per day from the Drayage Site. During the playoff rounds, extra team members are often needed to move the team robot from the pit station to the queuing area and playing field. Each Alliance Team can have three (3) additional Pit Crew members to help with necessary robot repairs and maintenance. These buttons provide access to the field. FIRST distributes the buttons to Alliance Captains during the pairing selection process on the sub-division fields. All teams should assume they could be chosen for an alliance. Each Alliance Captain must set a logistics plan for button distribution prior to the pairings to distribute the buttons to the Pit Crew members. Safety Captain Button: Each team will receive one Safety Captain Button for this voluntary position. Listen carefully for announcements about Safety Captain Meetings. Each team will receive one (1) non-transferable Team Media Pass and related instructions/caveats in its registration packet. Media representatives are permitted in designated media access areas around the playing field only during their team’s Qualification and Sub-Division Playoff Matches. The directions of Playing Field Supervisors must be followed at all times. Team Media are not permitted on: the actual playing field surface; in areas marked off for human players; in any private venues or VIP, Volunteer, or Judges’ areas, or the FIRST Media Center for professional, bona fide media. Mascots will not be recognized as an official team media person. Due to space constraints and limitations, Team Media will not be allowed on the field or pit area before or during Einstein Championship Matches. Each division has been assigned a 2-hour break on Thursday and Friday. Please use this time for lunch. Also take time to visit the Innovation Faire, Scholarship Row, Sponsors, and other FIRST Programs. We have reserved 40 seats per team for each of the Energy and Mass winning alliance teams at Ford Field. The reserved seats are in Sections 16 and 17 lower level. Teams will need to obtain the wristbands from the field Volunteer Coordinator. Beginning at 2pm on Saturday, April 27, additional security measures will be in place for the Einstein fields. Immediately following Sub-Division Playoff Matches, Division Champion drive teams and robots need to report to the Einstein Energy and Mass fields. A special access badge will be issued. The six (6) sub-division alliance winners are known as Division Champions. These teams will compete in the Einstein Round Robin Tournament to determine the winning alliance for Energy and Mass. The Daly field becomes the Einstein Energy Field and the Archimedes field becomes the Einstein Mass Field for the Round Robin Tournament. The conclusion of the Einstein Championship Final Matches will take place on the competition field at Ford Field on Saturday evening. The Energy and Mass winning alliances will compete in the Championship Final Matches to determine the Alliance Championship Winner and Alliance Championship Finalist. When the sub-division alliance winners are announced, each team will receive 40 wristbands to designate special seating for the Einstein Round Robin Tournament. Division Champion alliance teams will be seated in the bleachers (loading dock side) for the Energy (Daly) and Mass (Archimedes) fields. Teams will need to obtain the wristbands from the field Volunteer Coordinator. We will be clearing the bleachers (loading dock side) for the Energy (Daly) and Mass (Archimedes) fields starting at 12:30 pm on Saturday (or at the conclusion of the Sub-Division Playoffs Matches). Anyone sitting in these sections will be asked to move. These sections are reserved for the Division Champion alliance teams competing in the FIRST Robotics Competition Einstein Round Robin Tournament. In an attempt to improve match viewing for teams during matches, a designated viewing area in the bleachers (loading dock side) will be available for the six (6) teams in the current match. We ask that teams leave the viewing area promptly following their matches in a gracious manner, to allow the next set of teams to view. The viewing area will be monitored by event staff and volunteers to help ensure fair access to all. Parts requests will be grouped together and announced every 15 minutes. To submit a request, write your division, team number, and needed part on a piece of paper and give it to the Pit Administration staff. Additional announcements will be made at half hour intervals. Personal and irrelevant announcements will not be made. All parts requests will also scroll across the bottom of all Field Channels available in the pits. Please see Pit Cable Specifications below for more information. For safety purposes, be respectful of the pit closing time each day. On Saturday, April 27, only essential team members are allowed to disassemble and pack items in pits. Aisles must be kept clear for freight movement and team load out. Each pit will be provided with an RF Cable Drop. 12 channels will be available to watch in each pit: 6 Sub-Division Field Channels, with parts requests scrolling across the bottom, and 6 Sub-Division Rankings Channels. Additional information on pit cable specifications. There will be assigned pit spaces for FIRST Robotics Competition sub-division playoff matches to be shared by 4 team alliances. Alliances must work together to share the space accordingly including tools and equipment. Any pit structures cannot exceed 6 feet in height. Teams are responsible for knowing their match times and will have to queue 30 minutes prior to their matches without the help of an announcer. Teams need a minimum of 15 minutes to travel from their pit space to the playing fields. Please leave extra time to get back and forth between the pits and playing fields. For qualification matches, FIRST will make every effort to keep close to the published schedules. Keep close watch of the pit display for any moment-to-moment changes. There will be no audio queuing. A Quiet Room will be available for those participants who need a quiet space to de-stress and take a break from the business of the competition. In Detroit, the Quiet Room is located in 411C. The Machine Shop trailers and machines are graciously sponsored and managed by Comau LLC, Sector67 and Tormach Inc. The machine shop is located in Hall B of the Cobo Center, near the spare parts area. The machine shop is open Wednesday, April 24 from 10am-8:30pm, Thursday, April 25 from 7am-5:30pm, Friday, April 26 from 7am-6pm and Saturday, April 27 from 6:45am-3pm. Please remember that there is no grinding, braising or welding in your team pit, so please bring these requests to the machine shop. 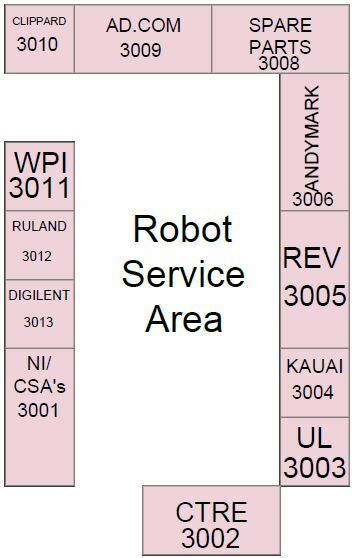 This Robot Service Center is an opportunity for you to seek and get support from Suppliers during the competition (e.g. technical help, spare parts, or assistance with repairs). It is located in the FIRST Robotics Competition Pit area. Hours - Wed. Hours - Thurs. Hours - Fri. Hours - Sat. REV Robotics REV will provide replacement and new parts to teams. We will also have our technical staff on hand to leand assistance to any teams in need. The Pit Map shows the Spare Parts location. Parts are available on a limited basis. The attendant will be able to contact a FIRST Technical Advisor or Lead Robot Inspector if you need approval for any of the applicable components. Schedules will be available on the Championship website and in the Championship App. The FIRST Championship App can be downloaded from our website or you may search for "FIRST Championship" in the App Store or Google Play Store. Install and open app. Tap on the Houston or Detroit guide from the home screen.